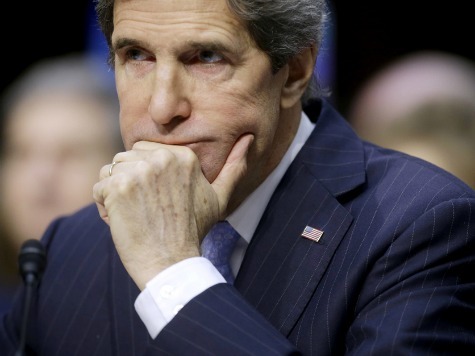 U.S. Secretary of State John Kerry is at it again, this time blaming Israel for the collapse in the peace process with the Palestinians earlier this year–and, he implied the rise of the Islamic State across the region. Israeli leaders are now openly saying what only Minister of Defense Moshe Ya’alon was bold enough to say, before the peace process collapsed: Kerry is an idiot and an egoist who would burn the region and expect a Nobel prize. Ya’alon, amusingly, is counseling his colleagues to be circumspect in their comments. But he surely knows he has been vindicated–not just on a personal level, but a policy level. Kerry is wrong on the substance of the two-state solution, which would certainly install a terror state on Israel’s most vulnerable border. He is also wrong on the process: the idea that there is actually a “solution” to the conflict is the region’s deadliest fallacy. If the Israeli-Palestinian conflict had to be “solved” overnight, it would involve Israel annexing most of the West Bank, including the Jordan Valley; the dismantling of the Palestinian Authority, which has proved to be little more than a conduit for terror funding and Nazi-like propaganda; and a war that removed Hamas from Gaza. A rump Palestinian state would be permitted in a few West Bank cities–and no further. End of story, forever. That “solution” would involve hundreds of lives lost, billions of dollars spent, and perhaps thousands of people displaced. It would probably yield a more stable equilibrium than exists at present. However, it would pose very significant costs to Israel, in terms of international isolation far worse than anything previously experienced. And without solving the overall strategic problems of Iran and ISIS, such a “solution” could become irrelevant. For now, the Israeli-Palestinian conflict is one that can only be managed. That is a point on which hawks like Ya’alon, and far-left doves like Tom Segev, agree–even if they disagree about how it is to be managed. By shooting at your enemy you are not in the deepest sense wronging him. But by hating him, by inventing lies about him and bringing children up to believe them, by clamouring for unjust peace terms which make further wars inevitable, you are striking not at one perishable generation, but at humanity itself. It is because Palestinians presume–correctly–that Israel will be blamed for anything that happens in the region that they persist in hatred. Blaming Israel has been standard operating procedure, both for Kerry and his predecessor, Hillary Clinton–and, of course, for President Barack Obama. Yet the two-state solution has been a bipartisan obsession for several decades. Though its defeat seems preordained, in retrospect, it was probably an experiment worth trying. Nevertheless, it is a total failure. Left-wing thinkers like Hannah Arendt once warned against Israeli statehood as a dangerous delusion, given superior Arab strength. Yet the Palestinian state is the true delusion. What must shift is the idea that Israel bears the cost. The demographic “threat” is an empty one, and Israel’s economy has thrived despite decades of conflict. Empty gestures such as Britain and Sweden’s “recognition” of Palestine just convince Israelis to dig in. It is time Palestinians felt the diplomatic cost of their warmongering.